In my last post about backups, we discussed the importance of backing up your data and explored backing up in the cloud. Today, let’s look at your options for backing up using physical hardware. Most of these drives connect to your desktop or laptop computer through the universal serial bus (USB) port on your machine. Installation usually involves plugging the drive in and letting your computer discover it. Many external hard drives come with third-party software to help you back them up. Once installed, you can access your external hard drive the same way you access your documents or another device connected to the computer. Backing up your data is as simple as clicking and dragging those files you wish to back up into the external drive. This process is usually done manually, but some services will take care of it automatically (such as Carbonite and other online services). This is the same process as an external hard drive backup, but using flashdrives or CDs. Since CDs hold much less data, you have to use multiples if you are backing up a lot of files. Of the two options, flashdrives are preferable, because CDs can easily become corrupted. Often people will use a physical backup solution and store it in a location away from their computer in case of a natural disaster or fire. 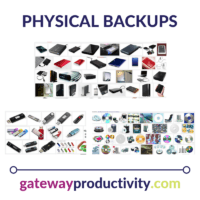 A physical backup is also a great option if your computer crashes. Many companies and individuals will use one of each type of backup to make sure they are fully covered in the instance of a computer disaster. Think about your needs, and start with something that’s easy for you to implement.